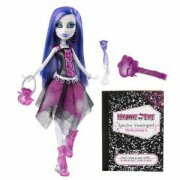 There is currently a UK short supply of Spectra Vondergeist Monster High Doll. By registering your email address we will email you as soon as stock is found. Our servers are constantly checking retailers websites for availability, so you don't have too! Our servers are constantly checking for Spectra Vondergeist stock, so you don't have to. Spectra Vondergeist, previously known as 'Ghost Girl', and 'Spectra von Hauntington' is the daughter of the Ghost and can float through walls with an "uncanny" ability to overhear school gossip! 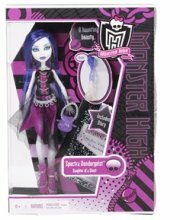 Part of the Monster High gang, the frightfully cool Spectra Vondergeist is not to be messed with her icy stare, stylish silky clothes and blue hair. For ages 6 years and over. Height 10.5 Inches. Doll cannot stand alone. Includes diary and toy bag.